Happy 20th Birthday Java! What’s your Java story? At the time I was working for Royal Sun Alliance and we were doing OS/2 client/server development using Application Manager, against a CICS/COBOL backend. One of the guys I was working with, Mike, said I should take a look at this new language called Java because it can run on any platform. At that time developing on OS/2 and seeing demand slowing for OS/2 AM developers, the promise of a development language not tied to a specific platform seemed an attractive offer, and a potential ticket to move away from OS/2. I started working through the exercises in the book, building my first Applets – I think one of the first applets I built was a lottery ticket number generator that I had on my webpage at the time. In 1996 it was pretty cool to have interactive content on your web site! Even though this turned out to not be Java’s strong point (most Java development is arguably server side now days), it was where it all got started. 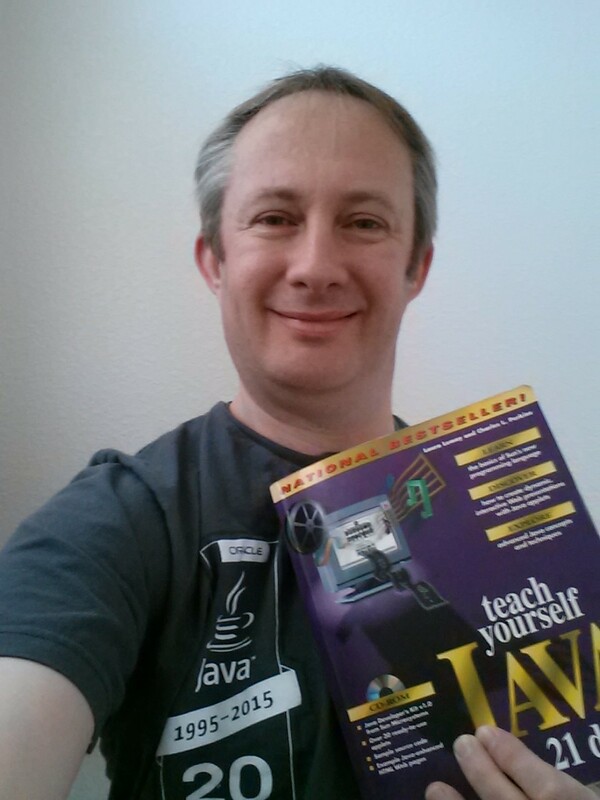 Although I continued to play with Java in my own time, it wasn’t until I changed jobs in 1997 and moved to TSW/Indus, a software house developing Enterprise Asset Manager software, that I had the opportunity to start Java development ‘on the job’. At the time the company had a Powerbuilder/Oracle PL/SQL based client/server product, and while in that first year I cross trained to Powerbuilder, we started prototypes of building a web-based replacement for the Powerbuilder client, against a Java backend. At the time this was using a ‘Java Cartridge’ on Oracle Application Server (I think it was called), and the Java code was invoked CGI-BIN style using HTTP GET query string parameters that were passed into Java code on the server. At some point pretty soon after these first prototypes the Servlet API came along, and then EJB1.x came along… looking back which was an absolute nightmare from a developer productivity point of view. Somewhere in there I also dabbled with some CORBA based backend running on a server that I think was called IONA (although those memories are long gone now). I’ve seen a lot of incredible changes in the Java space, and 19 years later from where I started, I’m still coding Java and it’s still going strong!